DO Montsant | Catalan wine in a nutshell! Catalan Wine 365 in a nutshell! 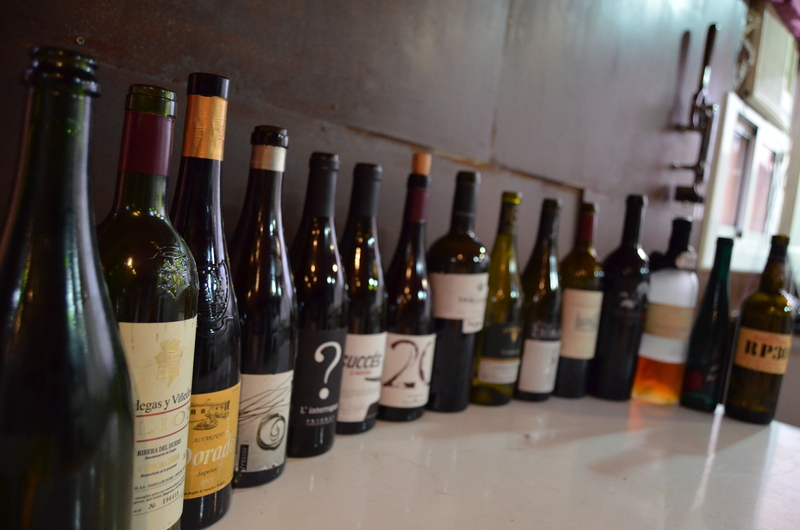 Satisfy My Soul and 15 Delicious Reds from Catalonia! I haven’t quite decided what to write about tomorrow and I can’t really say what I am going to do with the blog in 2015. That it will continue, in one way or the other, is clear and I am thinking that I might post once a week and then only do videos, as to change the theme somewhat. As for New Years Eve…., there will be wine, that’s for sure and there will be Cava, no Champagne! So, I’ll either do a piece on a good red or a Cava, or why not both? Catch me tomorrow and you’ll see, but whatever it is, it will Satisfy My Soul and hopefully yours as well! Thank you Bob! And now for some of the great reds from Catalonia! Enjoy! Just the fact that Sanahuja makes this wine using Pinto Noir gives me chills! And how they have managed to give it utmost care is to be admired. I really, really, want you to try this wine! I’m sure you’ll be intrigued and positively surprised whit regards to what can be produced here in the Conca de Barbera, if the wine maker is skilled. This wine has been made without any filtration or clarification, fermented with natural yeasts from the vineyard. As a result, the wine has virtually no sulfur. The aging is 6 months in French oak barrels. 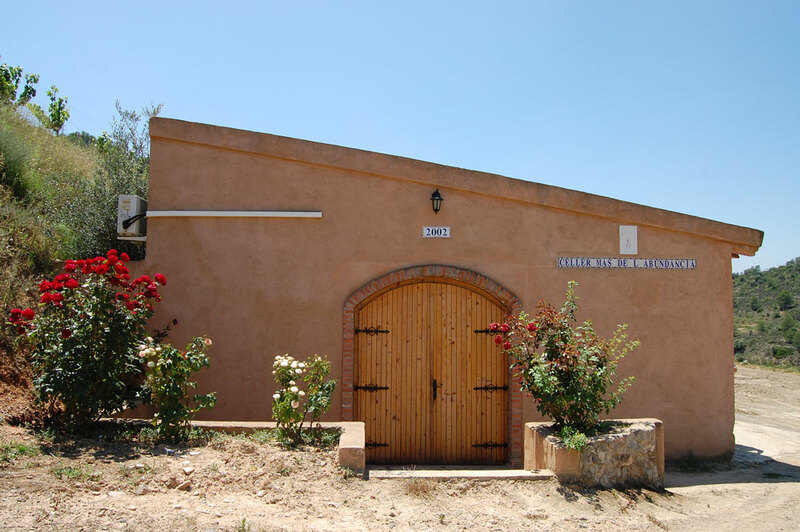 The Escoda-Sanahuja winery practice ecologic viticulture and to some extent biodynamic as well. This wine has been made using biodynamic principles. Light ruby color. The nose shows a lot, a virtual dance (samba?) takes place. Berries in masses, Mediterranean forest, fresh cut fennel, underbrush, chalk……. The palate is delicate, easy, wide and quite fleshy. 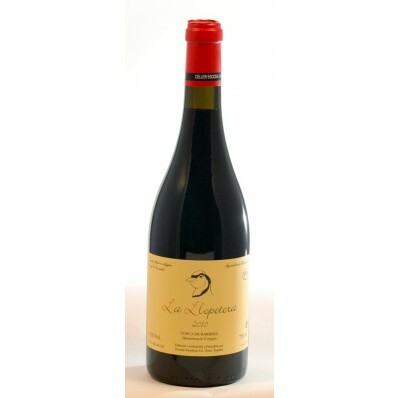 The wine has clear varietal and mineral character, which include fine notes of red fruits on light backgrounds of wood. Super fresh and elegant. It will get even better with time, my guess is that should have been drunk now, as it is still unruly and young. Will age slowly improving in character and elegance, give it another few years and I’m sure this will be a great one! This wine displays the benefits of slow, even ripening during a mild growing season. Though there is fullness and a lush character to this Merlot, there is also restraint and elegance. Promising aromas of cherry, red plum, raspberry, and dried herbs lead to a clean fresh entry with impeccably balanced acidity suporting intense red fruit flavors of cranberry, plum and raspberry. Round, supple tannins provide an enticing framework for the flavors and contribute to a lingering finish. Age a few more years and you won’t be disappointed! Splendid garnet red colour with light reflections of tile. A wine with finesse that I dare call opulent and big. Smoked bacon, cherry and truffles are the aromas that are primary and easily detected. Caramel, liquorice and tobacco are present but all intertwined in the most stylish way. A silky and smooth entry, classy and elegant with silky tannins. Toasted almonds, mineral notes and lingering soft spices. The after-taste is long almost chewy but the tannins are soft. 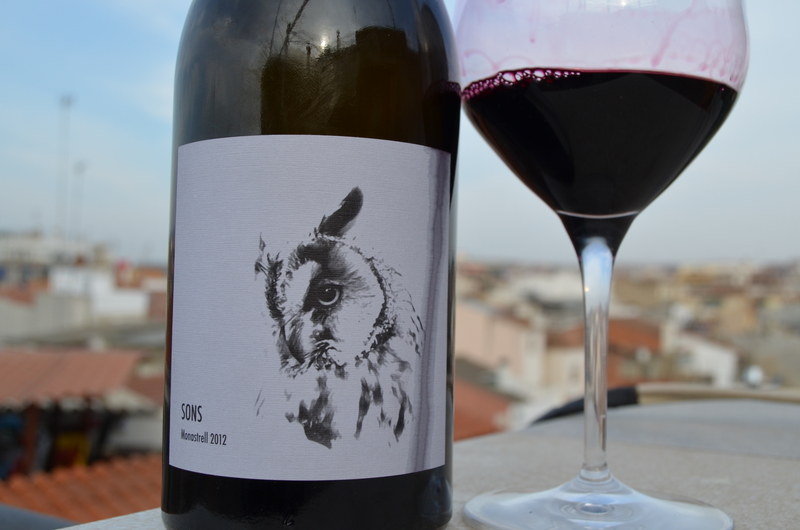 Sons 2012, 100% Monastrell – Fermented in clay amphoras in the vineyards of Sicus. The Sons is a wine that I intend to keep one bottle of and open it in 12 – 14 years as I am sure it can stand at-least that amount of time. The color is dark cherry, slightly bluish, pink rim with heavy and fatty tears, receding slowly. The first nose says a lot, leave me alone for a while and you shall be rewarded. A multitude of aromas evolve during the 2 hour tasting and there is a lot of fruit but also herbs and underbrush. Elegant floral aromas with intense aromas of red fruits such as mature strawberries, raspberries and currants. It is a mouthful, almost to be cut with a knife. The strain of Monastrell holds everything and concentration of the vintage gives very deep rustic shades, with cherries, raspberry, carob and chocolate. No food is needed and one glass of this bundle of joy can last forever! 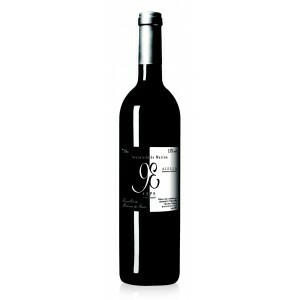 As the name indicates, 93 Ceps, (93 vines), the Sumoll grapes come from only 93 vines! 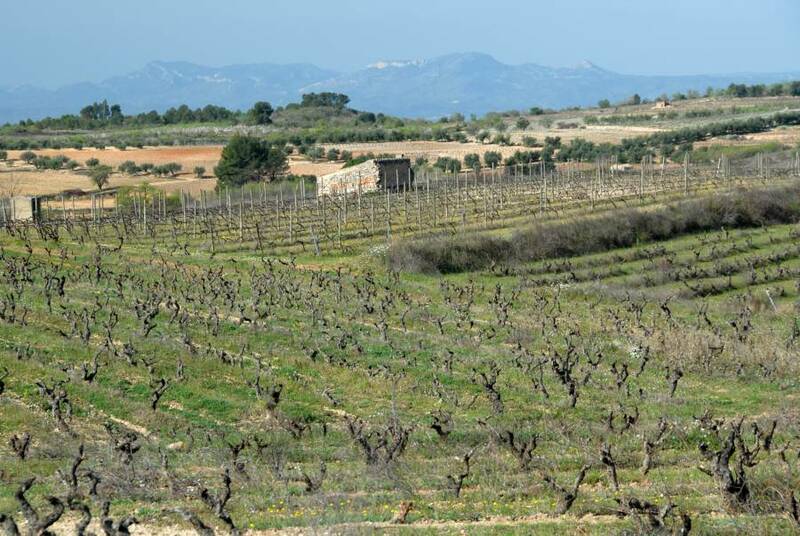 The vineyard is 60 years old and located in Santa Maria de Martorelles. The harvest was carried out during the first two weeks of October, collected in boxes of 15 kg. The harvest is de-stemmed and tread lightly and led throughout by gravity, without the use of pumps. The wine is fermented and macerated in stainless steel tanks of 1000 liter. 21 day resting period with 3 pigeages daily. 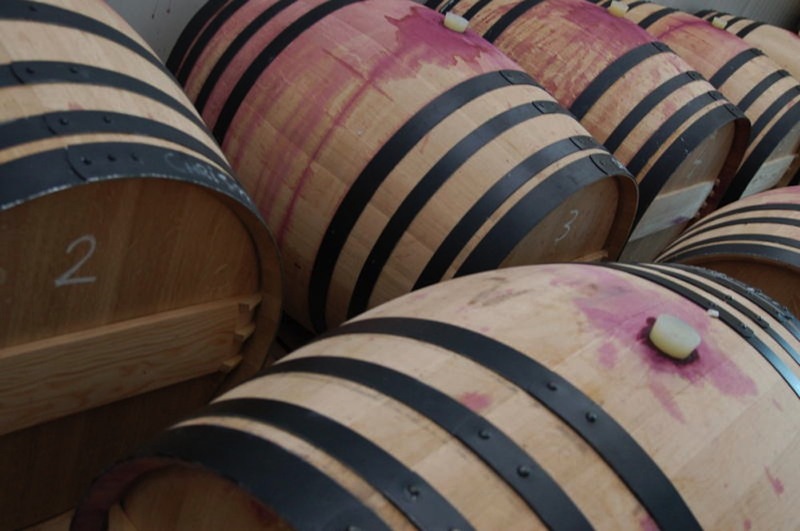 Malolactic fermentation is done in barrels of 225 liters of various backgrounds and different levels of toast. Aged for 14 months in new French Allier oak barrels. Production below 1,000 bottles. Medium cherry red color, shiny and bright, clean. The nose has good intensity, expressive and crisp varietal definition. Fresh red fruit (cherries, strawberries, plums) are dominating. Menthol, with notes of Mediterranean forest (thyme syrup , rosemary) are nicely laid out and carries the wine further to a second dimension. There are marked aging notes (aromatic cacao, lactic, smoked and curious notes of oriental spices (turmeric, curry leaves, cardamom) and a hint of graphite pencil lead. Intense spicy finish. A wine with a great personality. Braó was widely used as a word for strength and courage. These are the words that best define these very old and wonderful vineyards, which against all possible odds have offered rare and unique grapes. Bright cherry colour, intense, clean and bright with violet hues. Abundant slow-falling, dark tears staining the glass. Nose of ripe fruit, sweet spices, expressive, complex, elegant. Tasty, fruity, ripe tannins. Powerful, bulky attack. Slow, concentrated, silky and tasty in the mouth. Some intense tannins, a little bit rough but compensated with a very refreshing and defined acidity. Long and persistent finish with fruity notes. A serious wine full of life and joy! 12-13 months French oak. Powerful wine, structured, deep but with great elegance and finesse to drink now or store for many years. Cal Batllet, 5 Partides 2009, 100% Carignena, from very old vines! Aged for 15 months in French oak. 100% new barrels. The barrels are of 225 liters and the fermentation is carried out in open barrels at a maximum temperature of 26 º C, 4 pigiage daily, gentle extraction, long gestation and high control. Respecting the grapes fully! “Gratallops Vi de la Vila” is the new appellation for the wines produced from Gratallops, inspired by the Burgundy philosophy of village wines. The color is dark ink but not opaque, it is more of a deep purple. Red and black fruit with an overlay of jammy blackberries and red currant. This is a complex wine and the secondary notes were a bit hard to read as they were evolving minute by minute, but ground coffee and underbrush were present most of the time, blue berries and cassis showed up to join the show as well as slight hints of cedar and spices. The mouth receives a harmonious mix of savory ripe fruit, smooth and velvety with a multitude of rich flavors endorsed by time, better by the minute. 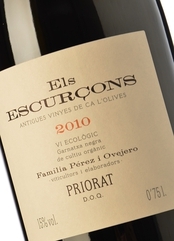 Have I found new favorite from Priorat? Yes, because they are ALL my favorites! Bright red cherry color with violet tones, middle layer. The nose is full of fruit, light touches of menthol, green leaves and pine. Good combination of fresh red fruit, herbs, thyme, rosemary and mineral notes. The palate shows some minerality. This is a fresh and balanced wine. Licorice, balsamic and butter, with a slight touch of camphor. The palate is light but persistent, with a subtle mineral background showing where it comes from. If you like Grenache, this is a wine for you! The fermentation of this particular wine takes place in small tanks on wild yeasts. There are no pumps in the winery as the wines are moved using inert gas to avoid any uncontrolled oxidation. Merlot, Cabernet Sauvignon and Carignan were harvested approximately 10 days later than usual or what would be considered normal for the varieties and region. Prefermentation maceration and alc. fermentation around 30-35 days for Merlot and Cab. Sauv. and around 25 days for Carignan , which is also longer than usual. During these periods, there are daily remontages and pigeages. 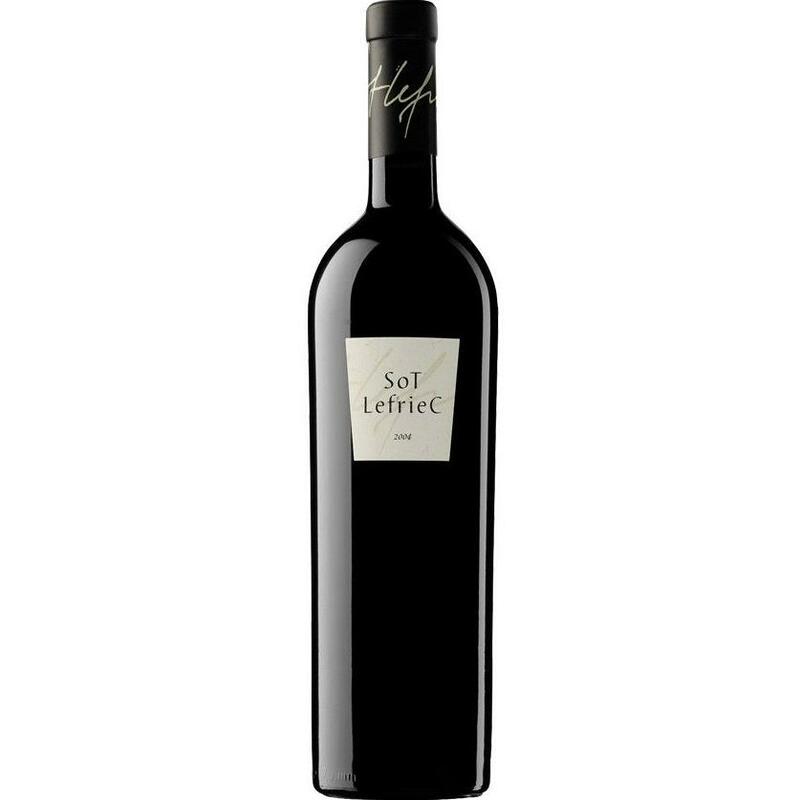 Sot Lefriec 2004 has spent 23 months ageing in French oak barrels, 70% new oak. This is a super small garage producer, that works out of Vilafranca del Penedes, so if you see a bottle of Sot Lefriec on a shelve be sure to grab it fast! Down and down I go, round and round I go, like a leaf that’s caught in a tide….., Black Magic is found in abundance in this Super Catalan that Alfredo Arribas had created by most probably using magic? This is a wine that shouldn’t exist, at least not in this region, because it defies all sensory logics when it comes to what the Priorat region equals and what wines from here in general are all about. Even the price is magical, an absolute value for money! And that, my friends, is why it is a Super Catalan. Cherry color with violet borders, high layers. Fine and elegant nose, floral notes, red and black fruits and a hint of wood. Its evolution is insatiable, pastries, balsamic, elegant wood, herbs, butterscotch, chocolate, cocoa, coffee….. What I have in the glass, is a great wine, very well put together (produced) and well balanced, harmonious and amazing nose. It is one of those wines that puts everything in perspective, primary, secondary and tertiary aromas dancing together as one at the end! Once in the mouth it is elegant and polished. Large and round, not tired or exhausted, very long and sweet. Very elegant balance. Make sure to decant at least half an hour and make sure to get two bottles when you buy this one, you’re gonna need them both! How much soul can a wine have? After trying Els Escurçons I´d say, unquantifiable! This is a wine with a beautiful dark cherry color, garnet rim and medium high layers. Bright and clean. The nose, after a while of areation, is spicy with creamy aromas, slightly oaky, ripe and complex. It is very expressive showing varietal fruit notes, like mature black berries. Mediterranean herbs, like thyme, fennel, rosemary and even a slight scent of lavender. Complex, in terms of the roasted notes found, chocolate and balsamic.It is powerful and elegant on the palate with a broad and intense entry, good acidity and polished tannins. It has a long finish with aromatic retronasal memories of spice, red fruit, herbs, wildflowers and light toast. Soul in a bottle! Love this Super Catalan! This IS the color of dark cherry! Some purple hues, clean and clear. Thick and abundant tears. The nose is clean and honest aromas of red and black fruit appear, strawberries and blackberries on a slightly spicy background which highlights the vanilla and coconut and light smoky notes. The palate is fresh, satiny, with sweet tannins and well integrated with the alcohol. It is a powerful, elegant and expressive wine, which blends red fruit with notes of pastry and fine woods. Long aftertaste where the fruit blends with notes of wood. Got to love this one! Dark cherry color with cardinal red reflections. Clean and bright, abundant tears. High intensity nose, expressive, full, concentrated and enjoyable. Ripe black fruit dominates and gives way to floral notes, spicy, toasted (which after a while become roasted) and deep minerals. The palate has a powerful entrance with a lot of volume. It is a fleshy red wine, with great weight deriving from the fruit, tasty, unctuous step, with excellent acidity and ripe tannic sensation. Balanced, long finish and very persistent. Laurel 2012 comes from the small winery Clos i Terrasses, led by Daphne Glorian, creator of the legendary and excellent Clos Erasmus. Laurel 2010 is a blend of Grenache, Cabernet Sauvignon and Syrah, aged for 15 months in second year barrels, in which the Clos Erasmus was aged. Recommend decanting about two hours. Another true Super Catalan! Oye Como Va, means “Hey how’s it going”….., Ay De Mi translates to “Oh My!”. And f I was a lazy bugger, which I admit to being at times, I would simply conclude the tasting with just that….., Oh My!!! Aromatic, well made and tasty are words that immediately come to mind! But let me be a bit more specific. The color is cherry red with purple edges. Tears that stain the glass. Primaries of black fruit with hits of spices, cinnamon and vanilla. Delicate notes of aromatic herbs and licorice at the background. Ample and rich on the palate with high presence of very ripe fruit, red sauce, ground pepper, cinnamon and caramel latte. Polished tannins and earthy feeling to end. 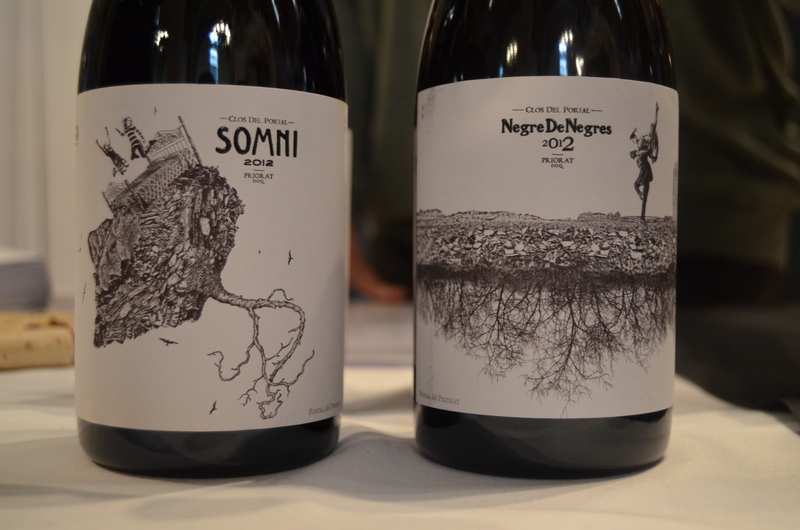 The Garnatcha Negra and Syrah for this cool wine comes from the D.O. of Terra Alta. From vines growing at 400 meters in elevation with significant temperature fluctuations from day to night, this is a cool and balanced wine. It has aged for 12 months in barrels 50% newer and 50% older. Try with savory roasts, braises, and rich, meaty fare. And then there was only 1 to go, tomorrow is the last day of 365 in a row! 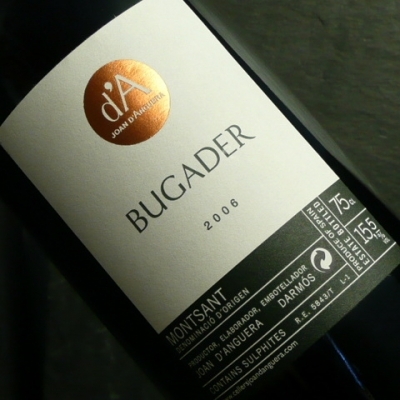 This young wine from the Genesis cellar, or more commonly know as Vermunver, is probably one of the ten best buys this year, quality/price comparison, and having in mind that this is a ¨drink it now wine¨and from the Montsant region. Clear and bright, cherry red color. 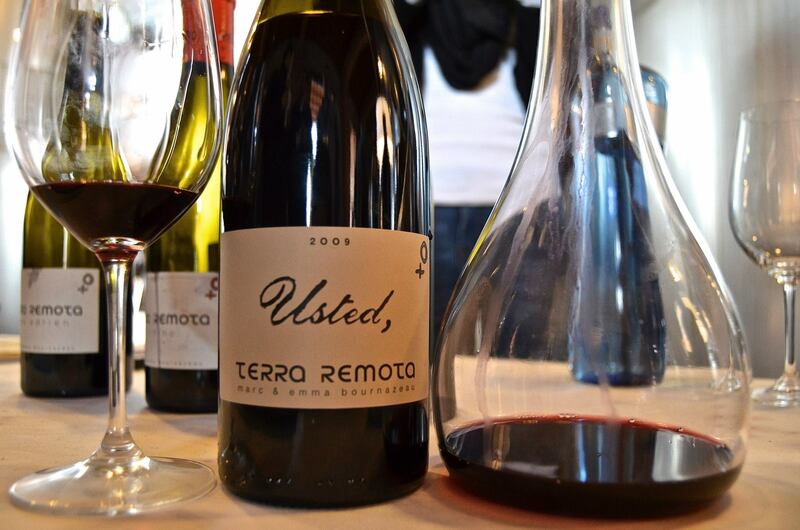 It displays raw freshness but without sacrificing the typical body of the wines of the region. 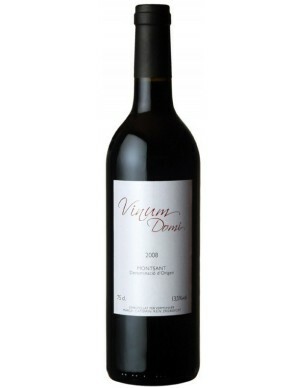 The nose offers an attractive combination of red fruits, raspberries and cranberries. An honest wine with some licorice notes that follows the fruit. The entry is fresh and I find it to be a wine that shows some minerality while still being easy to drink. 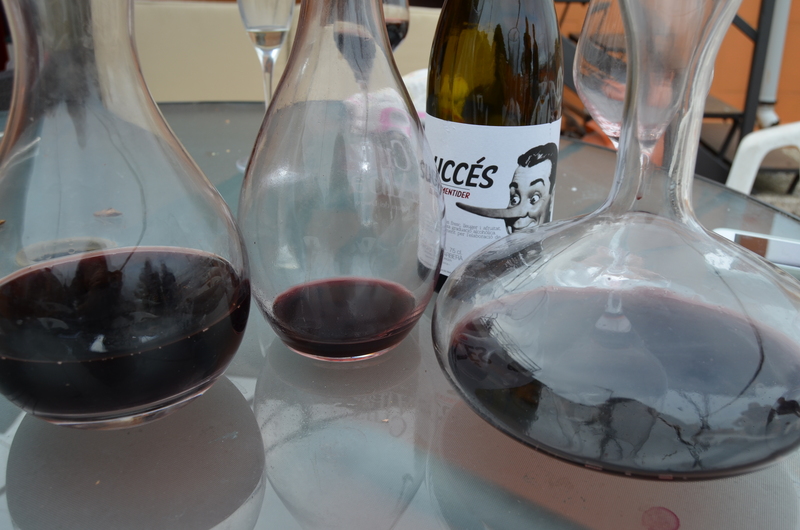 Cherry colour with a garnet rim, very intense, Gènesi Varietal is a high complexity wine. On the nose there are loads of black mature fruits, toffee, spices and forest with a balsamic touch. On the palate it is a wine with great terroir expression, wide, fleshy and a touch odd acidity that fills it with freshness. It has also an elegant tannic structure that indicates a good evolution in the bottle. 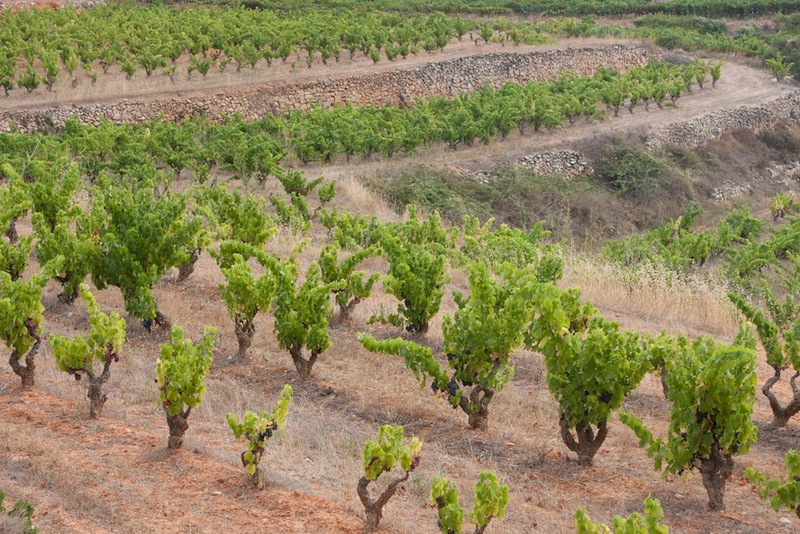 The Genesis Varietal consists of Old Carignena (also known as Cariñena or Samsó) from Vernet-Muntané family’s vineyards in Marçà. 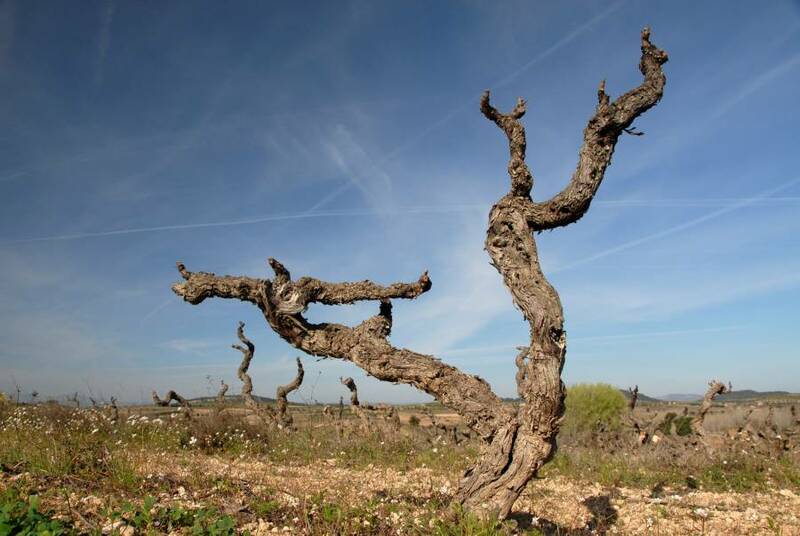 Vines are between 60 and 80 years old, soils are mainly clayey and calcareous, that gives complexity to the wines. Alcoholic fermentation is made in stainless steel wine tanks during 28 days under controlled temperatures between 25-27 degrees; malolactic fermentation is also done in stainless steel, once it has finished, the aging takes part in French and Hungarian oak barrels, over a period of 12 months. 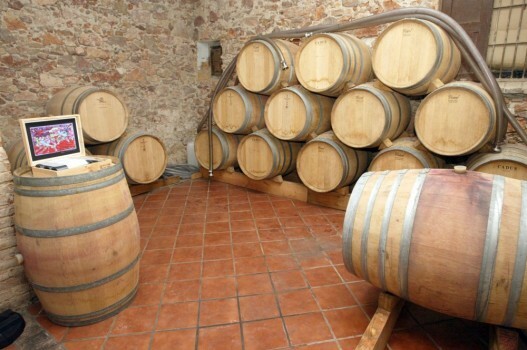 Celler Vermunver is a small, family-run company situated in the village of Marçà. It is part of the D.O. 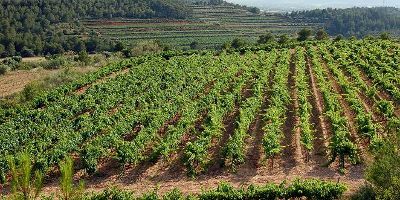 Montsant, one of the two ‘Denominations of Origin’ (wine appellations) in the administrative (but also wine appellation) region known as the Priorat. Some members of the Vernet-Muntané family make up the company. Roger Vernet Muntané deserves a special mention because he is the oenologist (winemaker). In 2004 they began working on the idea of launching the company of Celler Vermunver – a long-cherished ambition, which would mean they would finally make their own wine. This task, although daring, was well justified given that they could count on the excellent primary product, readily available to them, and the shared vision for the project. The starting point for this shared vision was to complete Nature’s circle: from the vineyard to the wine glass. The company’s environmental policy is based on recycling and making use of the waste materials generated in the production of wine. In this way, residual water which is not contaminated is used on an area of the vineyards destined exclusively for this use and all organic waste is used as an environmentally friendly fertilizer on the land. The cellar is located beneath an historic building in the village, Cal Nolla, a construction that dates from the end of the 19th C. The plan is to marry tradition and quality, creating a hand-crafted product without leaving aside new technologies and the advances that these have brought. Because we are speaking of a small quantity of wine, they are able to maintain personal control of all the elements within the production process; closely following the progress of the vine during its entire growth cycle, during the harvest when the grapes are brought to the cellar, until the final process of bottling the wine. 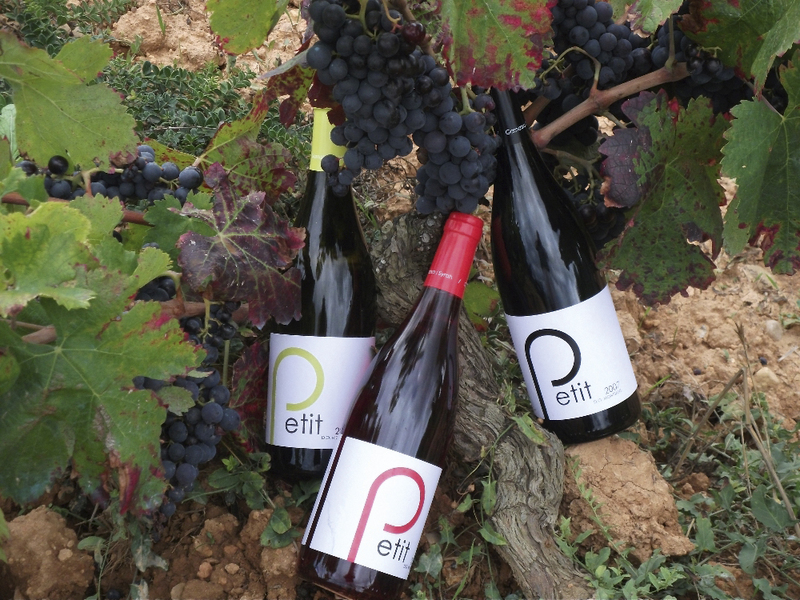 All their vineyards are to be found within the municipal boundaries of Marçà, in the south of the Priorat region. They are divided between various locations within this area, all with different orientations. In total, there are 23 hectares of vines, some grown on land owned by the company, others on rented plots. The vines are mainly of the grape varieties known as ‘Garnatxa’ (Grenache) and ‘Carinyena’ (Carignan), local to the region. 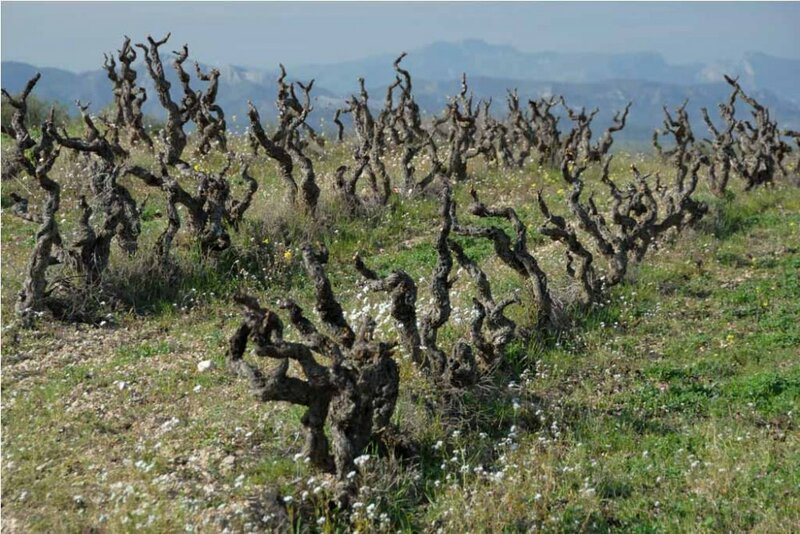 The majority, around 75%, are vines of between 70-80 years old, with a ‘Lot’ root stock, and grafted with the best shoots of the local vines of the area. They also have a small quantity of Merlot and Syrah varieties about 20 years old. The soil is slightly calcareous and the placing of the vines, planted by the grandfathers in the twenties and thirties, was magnificently done. The total production of Celler Vermunver is around 70,000 kg from which small amounts are carefully selected from the different sites. An anecdote relating to the selection of these plots is that on the municipal map of Marçà they form a figure that resembles the constellation of Orion, and for this reason they are called the ‘Vineyards of Orion’. With an annual production of around 5,500-6,500 kg, the cellar has created as the first product of the winery, Génesi Selecció. Intense red color with bluish tones. High viscosity. On the nose it shows high intensity, frank and clean. Expressive. Loads of fresh red fruit and mature blackberries. On the palate, the entry is fresh and good performance due to the concentration of tannins which are soft. The whole experience is very enjoyable and the wine has a nice flow to it and a long finish. High freshness, dominated by red fruits. The balsamic notes appear after a while together with chocolate and vanilla resulting in a long and intense aftertaste! The word that best defines the year of 2012 is “dry”. 2012 was marked by a lack of regular rainfall during the growing season. The year started with a mild winter, with only a few days of frost. Spring brought some rain during April that helped sprout the vines, however this was the only rain until October. As usual in the area the summer was typical, with high temperatures and extremely limited rain. With little rain and a warm summer, the vineyards had a very high level of water stress, which led to wastage in production and highly concentrated fruit. In October it finally rained again which helped to improve the ripening of the varieties that had not yet been harvested like the Cabernet and the Carignan. 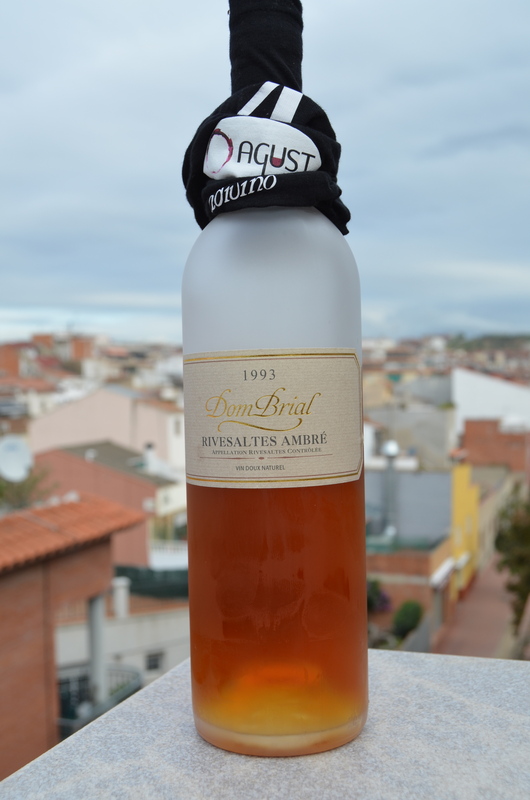 Mas de l’Abundància is located in the region of Priorat (Tarragona) and belongs to the D.O. Montsant. Up until the disentailment, in the 1830s, it belonged to the Prior of Scala Dei (the property still has three magnificent landmarks with the same boundaries of 1790). It had previously belonged to the Dukes of Cardona and Entenza, who gave it to the Prior on the 27 January 1727. It was always a self-sufficient estate, with planted vines, olive trees and a vegetable garden that allowed for its own subsistence. The soil type is “llicorella” (Tertiarycoal) and alluvium from the Quaternary; it has its own spring water and is located between the Siurana River and the old village of Les Pinyeres, a place of country worship, where from immemorial times the virgin of the same name is revered. The current winery was created in 2002 by the del Rio Mateu family, with the dream of returning to the origins and follow an family tradition, which hash´t been broken for generations, with a desire to produce a wine of the “terroir”. From the beginning the objectives were to implement effort, faithful dedication to the cultivation of the vine and extreme care in wine-making. Since 1995, when the project began, the two mottos are: “You can be humble but you should be excellent” and “Not only well made, but also pretty“. For me, all that remains now is to visit the cellar, and hopefully I´ll get to taste their white wine, de Calpino, which I have heard is something spectacular, but that´s a story for another day! The color is straw yellow with golden reflections, clear and bright. The nose is elegant and seductive, initial intense and complex aromas of white stone fruits (peach, apricot) accompanied by a bouquet of floral notes, spices, vegetables and balsamic on a strong background of toast. A number of very subtle aromas emerged constantly, menthol, white flowers and vanilla. Exquisite acidity and the alcohol is totally integrated. Notable is the perfect balance between fruit flavors, and the contribution of the barrel. Fresh, fleshy and unctuous on the palate, it exhibits lactic, citrus fruit and oak-ageing notes and culminates in a long, persistent finish. Wonderful wine that has no match! If you ever come across it, be sure to try it, I guarantee you are in for a unique experience. 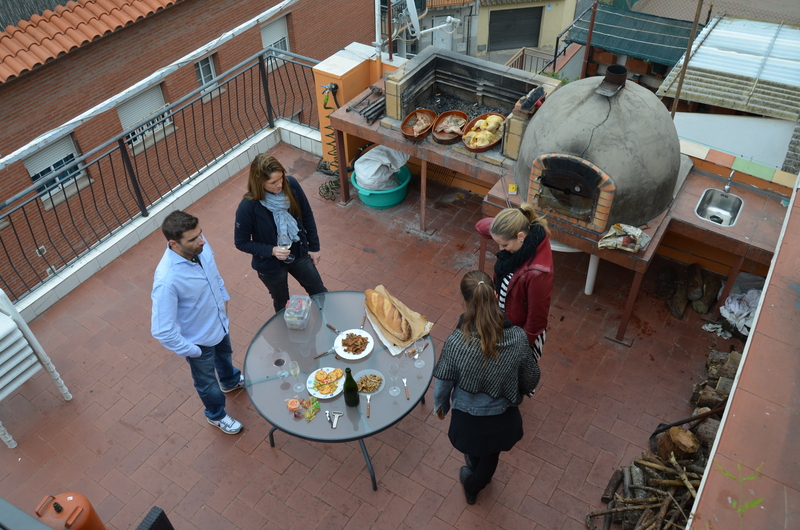 My preferred choise is to share it with good Friends! This Garnatxa Blanca single varietal originates from 80 year-old vines, grown at an altitude of 240 metres, in a parcel lying on slightly sloping ground facing northeast and southeast. Aged for 10 months in French oak barrels. A wine in the top echelon for quality and price. 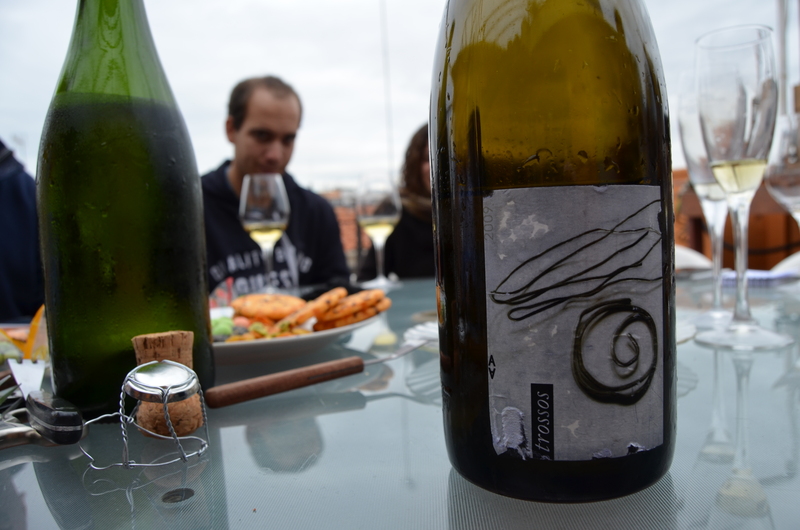 Alfredo Arribas’ Tros Blanc has no need to fear international competition, as it is right up there with the best of them, coating the glass like high-performing Californians or Burgundy Chardonnays and Sauternes. There is plenty of volume found on the palate too, with so much body you can almost chew it. Inevitably, the lengthy aftertaste constitutes a wine-lover’s joy, especially impressive since this is a very limited production wine available at an incredibly low price! Many a good red would seem weak and watery in comparison with this outstanding white, offering great complexity and elegance – and one that can be cellared too. 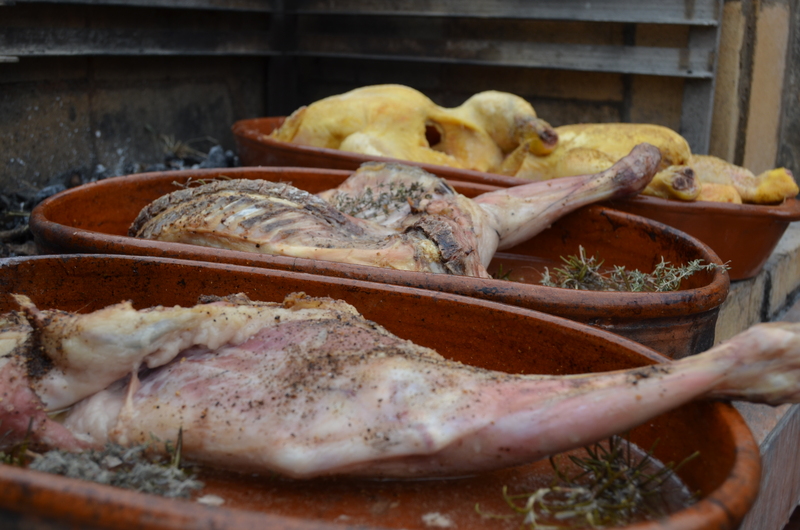 The lunch ingredients just about ready to enter the stone oven! Friends hanging out, waiting for the tasting and lunch to begin! 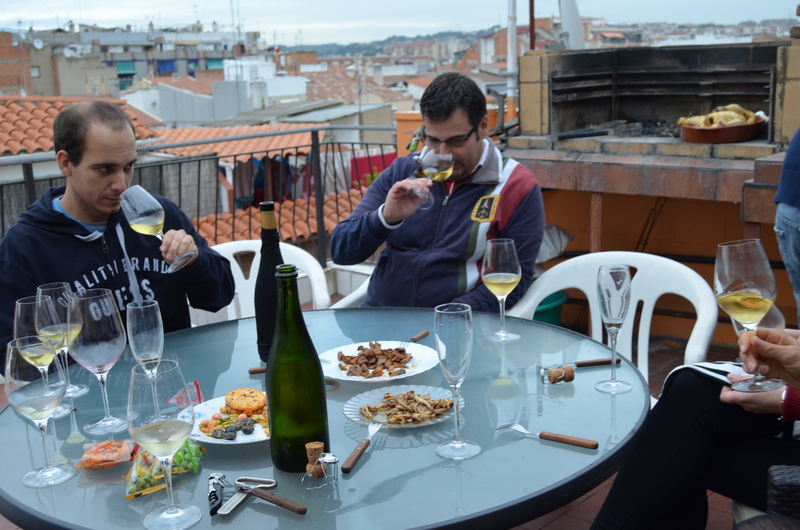 Introducing label less Cava, made by our host Miguel! Soft and nice, although still quite young! The best one, out of all of the wines the past Saturday! All I was asking them for was the name of the grape! 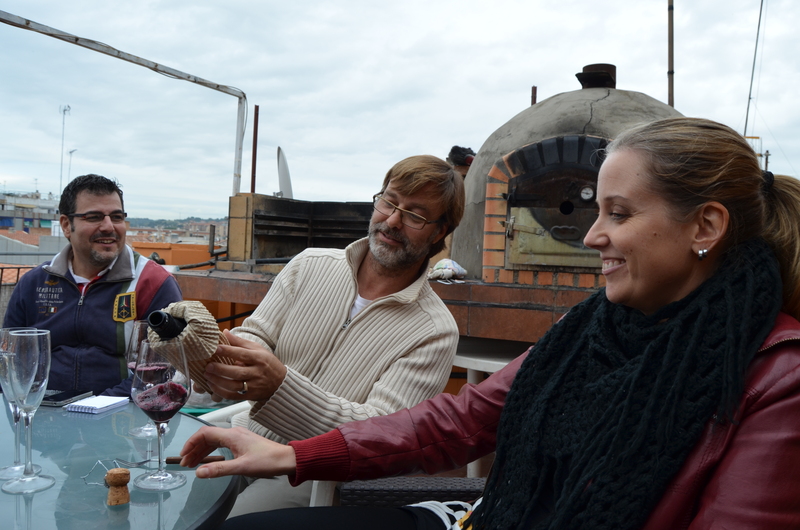 Blind tastings are a great way to learn how to interpret wine, always with a laugh at hand! Succes Vinicola, El Mentider, another great wine which I am doing a separate piece on later! A lovely starter! 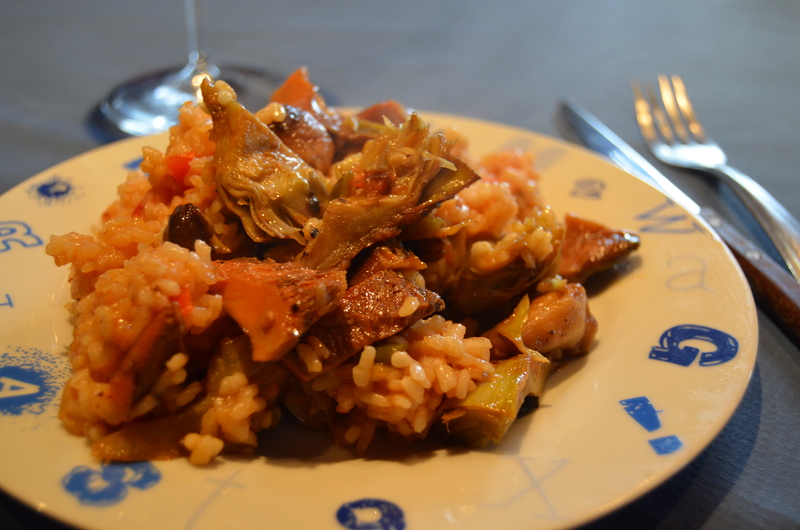 Rice with mushrooms and artichokes! With this one we tried four whites and one red! 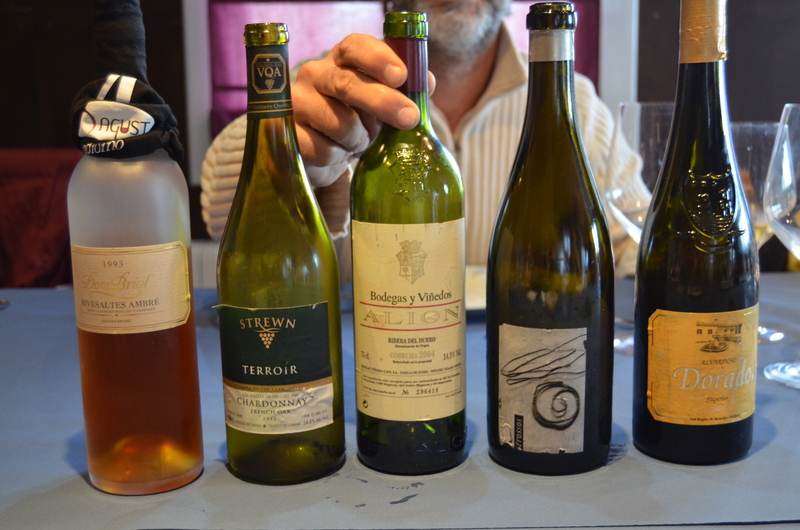 As we were lacking time we only managed to work through these wines! “Singular and unique” Dark cherry red color, dense and shiny. Aromas of mature red berries, jammy and sweet. Dried fruit aromas, dried fig and plum. Some raisin notes. Nice and expressive entry. Fresh and voluptuous, nicely balanced and round with a pleasant sweetness on the palate. The jammy taste of mature fruit works well with the well integrated tannins, which are almost always present in wines from the Montsant region. A stylish finish with a long, slightly sweet after taste, with well rounded tannins. A fantastic free style wine that can be paired with both meat and fish, with fruit and almost any kind of dessert. Aging 6 moths on French oak. The harvest was characterized by a large amount of fruit due to extreme climatic conditions; a short yet cold winter, a wet spring and a dry, hot summer. Grapes matured slowly. The pronounced thermal contrasts gave the wine a freshness with high alcoholic and acidic levels. The grapes were harvested when they were overripe, left to turn into raisins on the vine and handpicked using 10kg boxes. 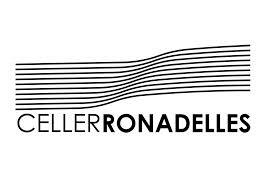 Celler Ronadelles is a small, family owned and run winery that lies in the shadow of the impressive Montsant mountain range. The winery came to life in 2002 and has gradually grown and developed until present days with its modern, elegant and innovative range of wines, under the distinctive labels of CAP DE RUC, GIRAL and PETIT de Joanne Cox. The small, dedicated team who are employed at the winery, care for the vines all year round before carefully preselecting and hand-picking the grapes at harvest time, always respecting the lunar calendar and integrating these traditional methods with modern technology. In the early 1920’s a group of practicing farmers, concerned with the decline of the soil, sought the advice of Dr. Rudolf Steiner, founder of anthroposophy, who had spent all his life researching and investigating the forces that regulate life and growth. From a series of lectures and conversations held at Koberwitz, Germany, in June 1924, there emerged the fundamental principles of biodynamic farming and gardening, a unified approach to agriculture that relates the ecology of the earth-organism to that of the entire cosmos. Regarded by some as the first modern ecological farming system and one of the most substainable, biodynamic farming has much in common with other organic approaches, such as emphasizing the use of manures and composts and excluding the use of artificial chemicals on soil and plants. Methods unique to the biodynamic approach include the use of fermented herbal and mineral preparations as compost additives and field sprays and the use of an astronomical sowing and planting calendar. Lovely dark cherry red color with garnet reflections and purple edge. The subtle aromas entering the nose are those of forrest fruits, it has a floral feel to it and some spice, white pepper and a little clove. Toasted notes appear. It is a easy wine, nice balance, quite wide. The fruit that appeared on the nose is also present i the mouth, together with the toasted notes. Has a medium long finish and good persistency. Price vs. quality is great, a bargain! Before being exposed to the market it gets to spend three months on French oak and 4 months in the bottle. 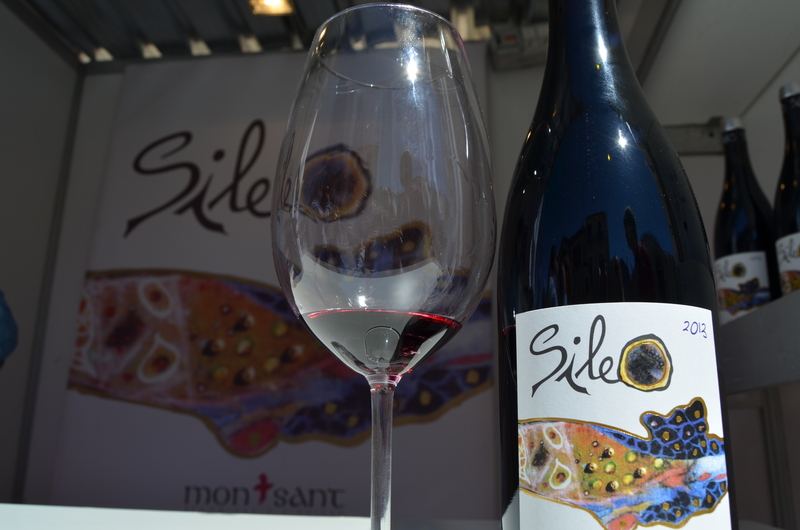 A young and well made wine from the Montsant. The three coordinated axes form a coup, which is a form of submerged vessel/tank, in which the wine was traditionally made here in Catalonia. Most houses, that had vineyards, would also have a coup, a three-dimensional space. In each dimension you will see one of the three main factors needed for this wine: X: (Longitude): Represents the vineyards planted in rows. Y: (Surface): Represents the hands that worked the vineyards and made the wine. Z: (Volume): Represents the cellar space which is needed for the aging of the wine, constant temperature, sufficient time, barrels and bottles. Celler Aibar 1895 is not all about the wine. This property belongs to a farming family with an agricultural business dedicated to growing grapes, fruit and olive trees. Mentioning the year of 1895 is in recognition of the efforts and commitment of their grandparents, forced to start from scratch, not once but twice, due to the devastation caused by the phylloxera. 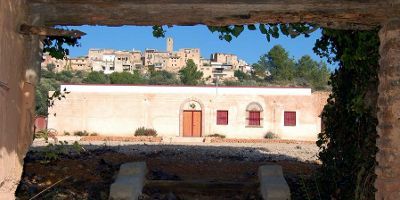 The cellar is located in the village of Darmós, in the D.O.Montsant, the property has an old irrigation well and the ruins of an olive oil mill, dating from the sixteenth century. You might think that, if it’s all about the bass, it could be boring and deafening, without depth and essence. If Garnacha is the bass and let’s say Carignena (which is the usual companion in a blend in the Montsant region) is the treble, which should constitute the perfect mix….., but you know what? If you know how to play the bass (forward to 2:24), you might end up with a wine like the Dosterras! This is not a size 2, this is a size 10! Deep cherry red colour with bluish/violet rim. Bright and clean with medium-high layer. Refined and stylish tears. Quite overwhelming aromas, loads of intensity and concentration of fruit. But it is not a four string instrument, it has so much more. First impressions are those of red and black fruit, mature and jammy, followed by some floral notes, spices and licorice. After a while there’s a sensation of well integrated, some menthol and coffee. A velvety feel in the mouth, large and full bodied, fruity and slightly mineral follow through. Great acidity, fresh and elegant. The tannins are not to noticeable, well hidden but carries the wine through a long journey in the mouth. All that is left is the lingering feeling of mature fruit and the bass! 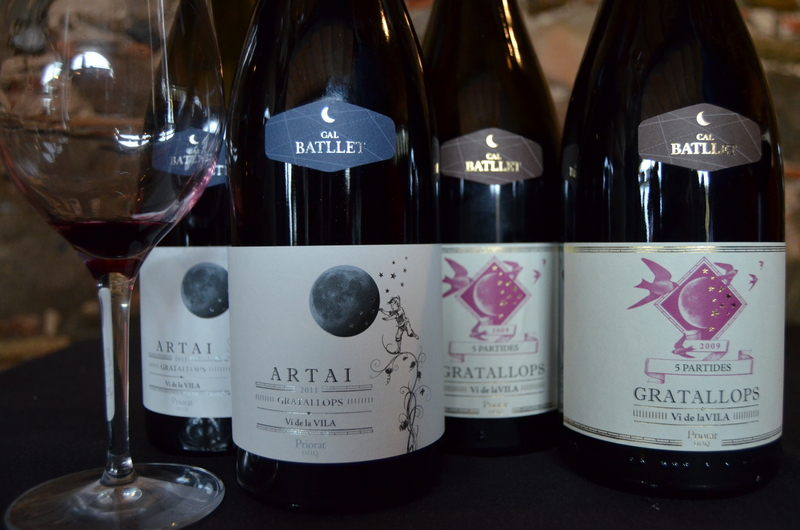 A great example of what can be done with high quality Garnacha grapes! Well done! 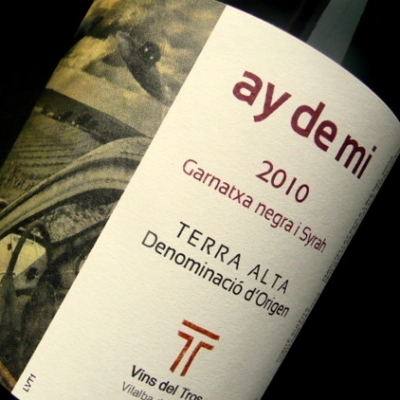 This wine is produced using grapes from 100 years old Garnacha vines from several very small plots. The yield in 2009 was minimal, in average half a kilo per vine, but that was what the wine maker wanted, high concentration! The grapes were manually harvested in small boxes in the early hours of the day. The winemaking is done plot by plot and according to how the grapes ripened. The wine was fermented with indigenous yeast in French oak barrels. After a long maceration and a light pressing, the blend was made and the wine put into 500 l. French oak barrels from different coopers, where it was left to age for 17 months. This wine was bottled in June 2009 and and released on the market in late September the same year. 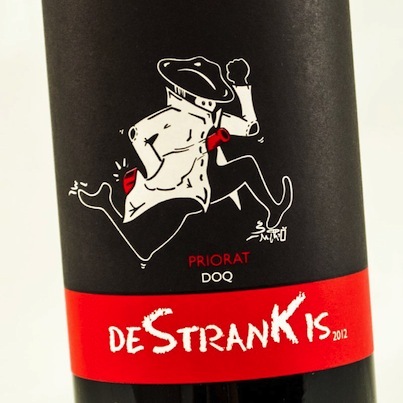 The Dosterras 2009 is a well produced, very elegant wine and one of the most expressive Garnacha mono-varietal wines of the region.